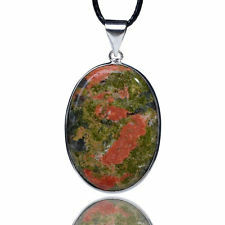 History – Unakite was originally found in the Unakas Mountiains in North Carolina, USA and that is how it got its name. Unakite is an altered Granite which is made up mainly of Pink Orthoclase Feldspar and Green Epidote with Clear Quartz, the stone may vary in colour depending on the makeup of dominant mineral in each piece. Unikite helps you to gently releases conditions blocking growth or change within your life, whether that be on an emotional or spiritual level and helps to bring balance between your emotions and spiritual self. In doing this it allows you to release any unproductive beliefs that you are holding from past experience and move forward in a calm stress free productive way. Unakite is a wonderful stone to use when you are working on the re-birthing process or going through any type of past life regression/therapy as it helps you to better understand the event of past lives that are effecting you in this life and allows you to move past them. Unakite is know as a stone of vision that assists you when opening or activating your Third Eye to allow you to bring through great knowledge and understand from your higher self and higher beings. Unakite allows you to go beneath the physical symptoms of a disease so that you can recognize the cause and allows your body to remember and move towards your perfect health. Once that perfect health state is recognized and remembered by your self it them assists with the healing process particularly in regaining weight loss and obtaining the healthy balance. Unakite is well know as a stone to assist healthy pregnancy as it is good for the reproductive system and promotes healthy development in new born babies. Healing – Treats reproductive system, stimulates healthy pregnancies and healthy newborns. Placed one under your pillow to assist with sleep as it has a calming effect.